Roughing It comprises Volumes 3 and 4 of the Gabriel Wells Definitive Edition of Mark Twain's works. The Appreciation was written by Hamlin Garland. 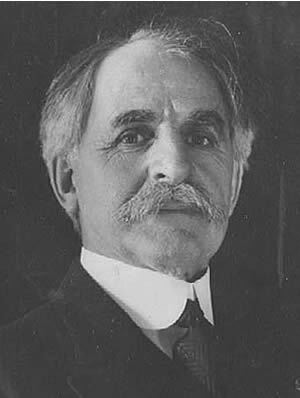 Hamlin Garland acquired the unofficial title "dean of American letters" after the death of his mentor William Dean Howells in 1920. Garland, born in 1860, was the son of a pioneer farmer. Some of his best known works chronicle the hardships of pioneer life on the Midwestern prairies. In December 1896 Garland began a series of articles for McClure's Magazine on the life of President Ulysses S. Grant. While Garland was engaged in writing his biography of Grant, he arranged a meeting in London with Clemens to interview him regarding Webster and Company's 1885 publication of Grant's memoirs. Although Garland had seen Clemens speak from the lecture platform, the interview in London was their first meeting. Garland asked permission to have their interview published in McClure's and Clemens agreed contingent on his wife Livy's approval. Mrs. Clemens refused to approve the McClure's publication, perhaps because of Clemens's heated denouncement of his former business partner Charles Webster. Garland's Ulysses S. Grant: His Life and Character was published in book format in 1898 it contains no mention of Clemens or his publishing firm Webster and Company. However, Garland inscribed a copy of his book for Clemens on June 14, 1899. In 1898 Garland traveled overland by horseback to the Yukon, a trip which inspired his The Trail of the Gold Seekers (1899). On January 10, 1890 he published a highly complimentary review of Mark Twain's latest book A Connecticut Yankee in King Arthur's Court in the Boston Evening Transcript. From 1902 - 1904 Garland was one of Harper and Brothers most successful authors with his own stories of the American west. Garland and his wife were guests in Clemens's home in February 1903 and Clemens's personal library contained a number of Garland's books. Garland's autobiographical Son of the Middle Border depicting pioneering life in Iowa and the Dakotas was released in 1917. In 1922 Garland's autobiographical Daughter of the Middle Border was awarded a Pulitzer Prize. Garland wrote his "Appreciation" for Roughing It while riding the crest of popularity that came with his Pulitzer recognition. A BOOK which is alive, after sixty years of publication and re-publication in various forms, must be taken as having within its pages something which makes for longevity. It was in quest of this quality that I today took up and re-read Roughing It after nearly twenty years of talking about it. I did this with an eye to the changes which have come to my own way of thinking as well as to the possible changes in the values of the book. I found myself interested and moved, though not precisely as I had expected to be interested and moved. My first reading of this book took place in a pioneer cabin in Mitchell County, Iowa, something like forty-five years ago. I recall reading the book aloud in the family circle, while my father shed tears of merriment, and my mother shook with silent laughter over the story of George Bemis and the Buffalo, the description of the self-confident dog chasing the coyote, and the interview of "Scotty" Briggs with the Missionary in the mining camp. I distinctly recollect being obliged to pause now and again in order to subdue my paroxysms of mirth. We considered this the funniest book we had ever read -- and we were right. A little later, perhaps in 1877, I took Roughing It as the theme for a class essay at the little Seminary in which I was a student, and I remember with painful distinctness that my teacher chided me for being over-enthusiastic in praise of the author's description of Lake Tahoe, a reproof which makes note however of my discovery that Roughing It was something more than a collection of droll stories. To-day, in the city of London, I find myself in another and yet not vastly different mood. With all its humor, its exaggeration, its occasional coarseness, Roughing It impresses me as a social document of great value, a perfectly sincere, vivid, and competent record of a time long gone and swiftly receding. Not a line, not an epithet, but has in it the savour of the mountain West, of the early Sixties, as the least fragment of a sage bush retains and exudes the aroma of the desert. Nevertheless time has changed the values of this book, and altered its relationships. The funny passages are still funny, but some of them over which I shouted, provoke only a smile. I linger now over the masterly characterization, and the vivid pictures of men and beasts, of earth and sky. The lines in which the pony express rider is depicted stir me to-day more deeply than they did forty years ago, for they bring back the heroic age of the Middle Border in which my father had a part, though not precisely so strenuous a part. Some of the phrases of the book like those which describe the mountains as, "Sultans of these fastnesses, turbaned with snow," and those which describe the phosphorescence of the skeletons lining that dreadful pathway in the desert are of that finality of expression which leaves little chance for change hardly for improvement. What a panorama the book presents! First those twenty days and nights of travel on an overland stage during which we see, almost as with our own eyes, the plains, the buffalo, the red men, and the looming purple peaks of the Rampart Range. We share the slow crawl up the Continental divide, and the swift descent to the Western slope. We catch a glimpse of Salt Lake and its curious people, and we enter intimately the turbulent life of Virginia City and Humboldt. It is all there set down in honesty as well as in humor by the hand of a master. Clemens was not writing as a superior person, as one who had looked down upon the gold-seeker, he was one of them. He had been an unkempt gold-seeker and dreamer himself. He had gone hungry with them, loafed with them, drank with them, and had shared in their good fortune. The tone of the book is as unaffected as it is faithful. Despite its occasional obvious exaggerations, it is a volume to which the Historians of the Present and the Future can turn for a revealing record of life on the plains and in the Mountains during the ten years which include the Civil War. Roughing It moreover is not only the history of an epoch, it is the chronicle of a man enjoying himself. For the most part this rough-hand episode in the life of Mark Twain takes on the character of a glorious youthful adventure. It is this quality which gives the book its undying appeal. Per contract, I must have another six-hundred-page book ready for my publishers January 1st, and I only began it to-day. The subject is a secret, because I may possibly change it. But as it stands I propose to do up Nevada and California, beginning with the trip across the country in the stage. Have you a memorandum of the route we took, or the names of the stations we stopped at? ... I remember next to nothing about the matter. Jot down a foolscap page of items for me. But the work thus begun made lagging progress. Illness and bereavement came, and, though there were intervals of enthusiasm, he had accomplished little by the end of the year. The prospect of the new book as a whole became gloomy, the idea less inspiring. With his many distractions it was all that he could do to keep up with his work on the paper and a department which he had undertaken for the Galaxy Magazine. It was Joseph T. Goodman, former editor and owner of the Virginia City (Nev.) Enterprise, who stirred fresh enthusiasm in the new book. Goodman in 1862 had put Mark Twain into journalism. Now, nine years later, he had come visiting to Quarry Farm. Clemens welcomed him eagerly, but seemed blue in spite of his splendid fortune. trying to write a funny book, with dead people and sickness everywhere. Mr. Langdon [his father-in-law] died first; then a young lady in our house, and now Mrs. Clemens and the baby have been at the point of death all winter. Oh, Joe, I wish to God I could die myself!" "Mark," said Goodman, "I was reading critically; not for amusement, and so far as I have read and can judge, this is one of the best things you have ever written. I have found it perfectly absorbing. You are doing a great book." Mark Twain had unstinted faith in Goodman's judgment and frankness, and nothing could have given him new life more certainly or more promptly than this verdict. 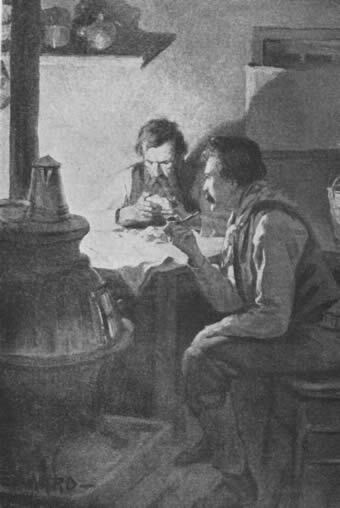 He urged his visitor to remain, and daily they reviewed old scenes together, while Clemens piled up copy and material so fast that in a few weeks he was writing to Bliss, "I have enough material on hand now to make (allowing for engravings) four hundred pages of the book, consequently am two-thirds done." He said that he intended dedicating the book "to the late Cain," out of commiseration for him, in that it had been "his misfortune to live in a dark age that knew not the beneficent insanity plea." Whether he really intended this dedication or not does not matter now. At all events, he concluded to inscribe the volume to his old mining associate, Calvin H. Higbie. Higbie appears in the volume under his own name, also Goodman. '' Dan,'' his fellow-reporter on the Enterprise, was William Wright, well known on the Western coast as "Dan de Quille." Roughing It appeared from the press early in 1872, and was immediately successful. The popularity of the Innocents had prepared the public for a new Mark Twain book, and the episodes and scenes it presented were of special interest at the moment, and peculiarly adapted to Mark Twain's literary expression. In a different way Roughing It seems quite as remarkable as The Innocents Abroad. If it has less charm, it has keener interest, and it is by no means without charm. Its humor is fresh, rollicking, altogether delightful. It is, in fact, a marvelous picture of the overland pioneer days-the frontier aspects-at a time when the frontier itself, even with its hardships, was little more than a joke; when the frontiersmen were obliged to be laughing philosophers in order to survive the stress of their rude warfare. "Western humor," so called, is the wildest, freshest humor in the world, but in those days at least there was hardship, even tragedy behind it. The sales of Roughing It during the first three months aggregated nearly forty thousand copies- more than the Innocents had sold at the end of its first year. It did not maintain this relative popularity, and in the long run fell somewhat behind its predecessor. Perhaps the reason lies in the fact that the life it presents was so transitory -- a mere phase -- a story begun in a day and almost as quickly ended. Roughing It is divided into two books in the Gabriel Wells Definitive Edition. This division is identical to the division utilized for the 1899 uniform edition of Roughing It first issued by American Publishing Company. Volume 3 ends with Chapter 41. Volume 4 begins with new chapter numbering and what was once Chapter 42 in the 1872 first edition is Chapter 1 of Volume 4. Volume 3 features a frontispiece illustration titled "Mark Twain and 'Cal' Higbie in Their Esmeralda Cabin" by Edmund Franklin Ward (b. 1892 - d. 1990). Ward, a native of White Plains, New York, attended the Art Student's League in New York where he studied under Edward Dufner, George Bridgeman, and Thomas Fogarty. Ward began his professional career in New York in 1912 sharing a studio with Norman Rockwell and working with magazines such as St. Nicholas, Youth's Companion, Saturday Evening Post, Ladies' Home Journal, McCall's, and Woman's Home Companion. When Albert Bigelow Paine's "The Boys' Life of Mark Twain" was serialized in St. Nicholas in 1915-16, Ward provided the illustrations. Harper and Brothers published The Boys' Life of Mark Twain in September 1916 with a number of Ward's illustrations. The selection of Ward's illustration as a frontispiece for the Gabriel Wells edition of Roughing It likely likely indicates that Paine was playing a pivotal role in selecting the illustrations as well as recruiting the writers who provided "Appreciations." In addition to Ward's frontispiece, the illustrations by Benjamin West Clinedinst that had originally appeared in the 1899 uniform edition of Roughing It were reused along with an uncredited photograph. Volume 4 features the frontispiece portrait of Mark Twain from 1871 that had been engraved by W. H. W. Bicknell for part one of the 1899 uniform edition of Roughing It. The illustrations by Benjamin West Clinedinst from 1899 were also reused. Fishkin, Shelley Fisher, ed. The Mark Twain Anthology. (The Library of America, 2010). Garland, Hamlin. Companions on the Trail: A Literary Chronicle (1931). Reprinted in Twain in His Own Time, Gary Scharnhorst, ed., (University of Iowa Press, 2010), pp. 251-252. Garland, Hamlin. Roadside Meetings (1931). Reprinted in Twain in His Own Time, Gary Scharnhorst, ed., (University of Iowa Press, 2010), pp. 225-228..
"Hamlin Garland Is Dead at 79," Cleveland Plain Dealer, 5 March 1940, p. 14. Newlin, Keith. Hamlin Garland: A Life. (University of Nebraska Press, 2008).